Soldiers from the South Carolina Army National Guard headed to Texas May 21, 2018, in support of Operation Guardian Support, President Trump's mission to secure the southern border. Nine soldiers from the South Carolina National Guard are expected to arrive in Texas to support Operation Guardian Support, the President's mission to secure the southern border. 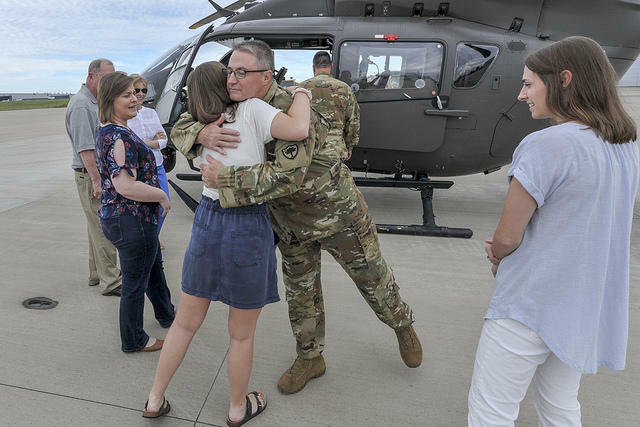 The mission includes three flight crew aboard a UH-72 Lakota helicopter and six maintenance soldiers who traveled by ground. The team departed from the Donaldson Flight facility in Greenville and was expected to arrive in Austin Texas around May 19, but was delayed by weather conditions the week prior. In a statement Gov. Henry McMaster said the men and women of the Guard are ready and able to support the president's mission. The South Carolina National Guard has provided border security support in the past, including the late 1990s in the San Diego area, 2007 along the Arizona-Mexico border, 2012 and 2016 in Texas. The nine Soldiers are expected to be on the border by May 25. An additional UH-72 Lakota and three flight crew from the South Carolina Army National Guard are scheduled to augment support later in June.